It has been said that the year 2014 would be the year of curved smartphones. 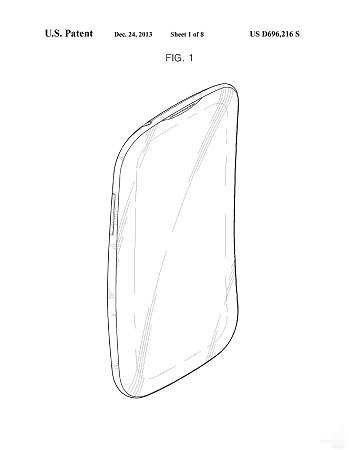 Right on time one of the leading aspirants in the curved smartphone race, Samsung, has been awarded a new patent that the company could use to build differently curved handsets. The US Patent & Trademark Office (USPTO) has granted a range of patents to Samsung which include new flexible smartphone designs, dockable tablet with non-traditional designs. The new smartphone patent shows a vertically curved handset, somewhat like the LG G Flex. However as of now no details about the smartphones from these patents are available. The company’s first curved smartphone, the Samsung Galaxy Round couldn’t garner appreciation due to the LG G Flex that followed quickly. So it is not surprising to see Samsung working harder to beat its rivals with the vertically curved smartphone. Further there seems to be some kind of pattern on the back which may see some bendable metal.